SAN FRANCISCO – After an 18-day strike, the musicians of the San Francisco Symphony ratified a new 26-month contract April 13, including a 4.5 percent salary increase that raises the annual base salary from $141,700 to $148,200. Musicians initially called for a 15 percent pay hike to keep up with the Bay Area’s high cost of living; management had offered 2 percent. The musicians, members of the American Federation of Musicians Local 6, overcame draconian proposals to slash pay of substitutes and extras. They defeated efforts to create a tiered workforce with substitute and extra musicians paid less for performing the same job. Though the musicians kept the medical plan in which most orchestra members are enrolled, they will have to pay more out-of-pocket. Orchestra members said that, and “minimal changes” in working conditions, amount to a net pay cut. The musicians also defeated a proposal to raise the minimum retirement age to 65, from the present 62. “We are very happy to be bringing our music back to the stage at Davies Symphony Hall,” negotiating committee head David Gaudry, a violist, said in a statement. In contesting management’s claims of financial hardship, the players cited the orchestra’s endowment – at near $300 million the second largest in the country. They pointed out that management spent $11 million on a centennial celebration last year, and plans to spend as much as $500,000 on expanding the orchestra’s home auditorium, Davies Symphony Hall. 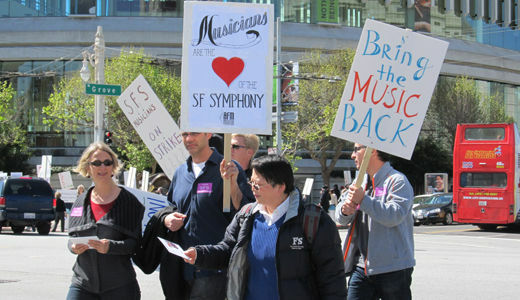 The strike by the San Francisco symphony’s musicians was one in a series of recent labor disputes affecting symphony musicians around the country, as orchestra managements, pleading loss of revenue during the Great Recession, sought concessions from players. The most drastic situation is that of the Minneapolis Orchestra’s musicians, locked out since Oct. 1. In a letter to the Minnesota Orchestra’s CEO, Michael Henson, earlier this month, the orchestra’s negotiating committee pointed out that musicians have offered several proposals that management has rejected, including binding arbitration and play-and-talk with a no-strike guarantee. They also noted that the musicians voluntarily gave back $4.5 million in contract concessions in 2009, and management rejected their offer of further concessions in 2010. Their sister Twin Cities ensemble, the St. Paul Chamber Orchestra – also locked out Oct. 1 – recently reached a tentative agreement. In Atlanta, Ga., symphony musicians were summarily locked out after they proposed to take an 11 percent pay cut if senior management staff would do the same. They later agreed to accept a significant pay cut as well as reduction of the orchestra’s membership from 93 to 88 musicians. Senior management also took a 6 percent cut in pay. Marilyn Bechtel writes for the People’s World from the San Francisco Bay Area. 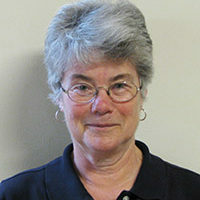 She joined the PW staff in 1986, and currently participates as a volunteer.